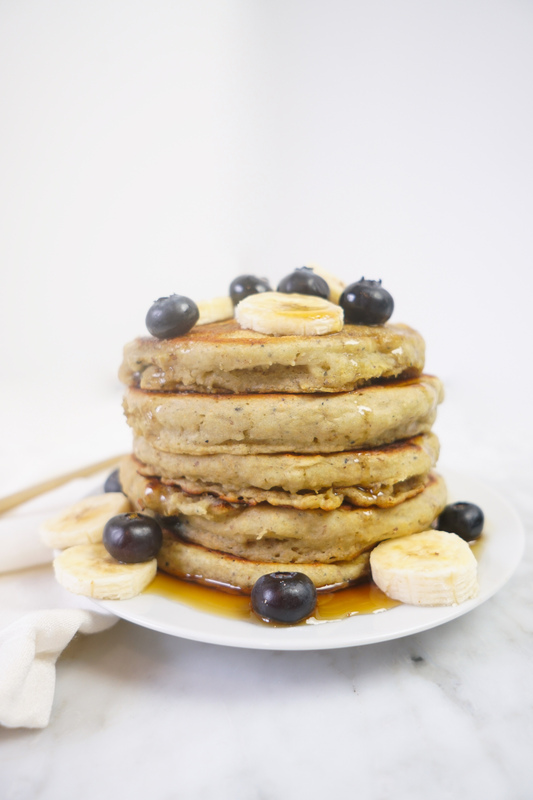 Vegan Yogurt Pancakes - made whole grains + blueberry vegan yogurt! 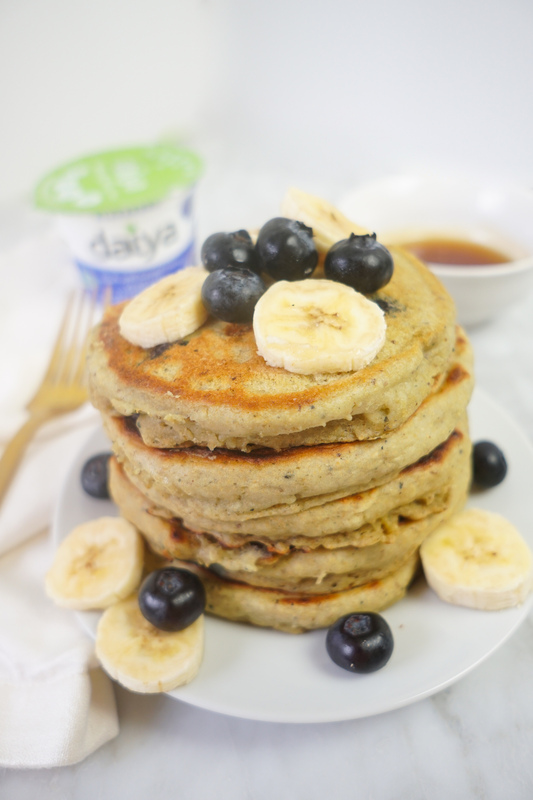 These blueberry vegan yogurt pancakes are so light and fluffy thanks to Daiya’s new Blueberry Yogurt Alternative. If you asked me whether I love waffles or pancakes more, I’d be hard pressed to provide an accurate answer. 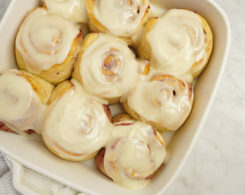 How do I love sweet, doughy breakfast items? Let me count the ways. I love them both immensely – for their similar and unique attributes. 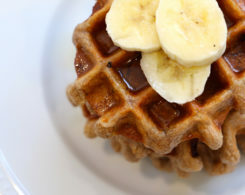 Waffles have that delectably crispy but chewy mouthfeel, while pancakes are like a warm, soft hug on a Sunday morning. They both satisfy my sweet tooth and my cravings for complex, energy-providing carbohydrates in the AM. The truth is I am happy with either – in all of the delicious, varied ways they’re offered. Because of this, I think you can never have too many waffle or pancake recipes on hand. 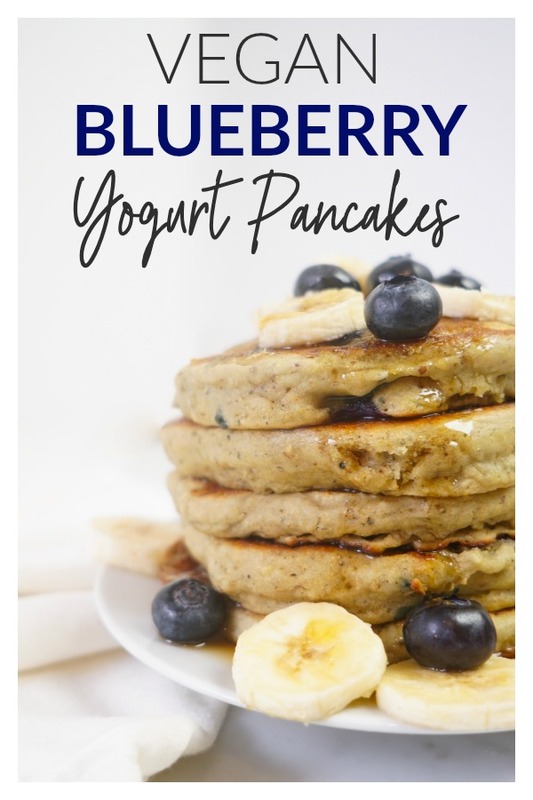 So today, I’m hooking you up with my latest and greatest in this department – my Blueberry Vegan Yogurt Pancakes. These things are off the charts good. 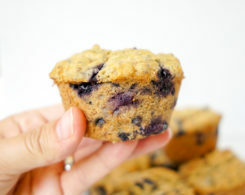 Made with Daiya’s new Blueberry Yogurt Alternative, they are light, fluffy, and ever-so-sweet, without the addition of extra sugar. Daiya’s new Yogurt Alternative is ultra-creamy thanks to the main ingredient, coconut cream. With only 9 grams of sugar and 6 grams of protein per serving, it’s a healthy choice for a balanced breakfast. 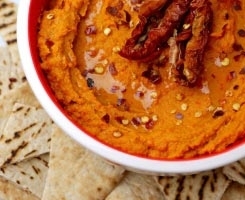 Plus, like all of Daiya’s delicious products, it’s entirely plant-based. 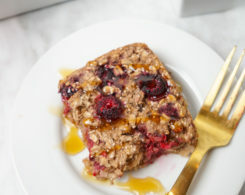 The brand is committed to continuously expanding their line of delicious, better-for-you versions of foods that people already love to eat – got to love that! 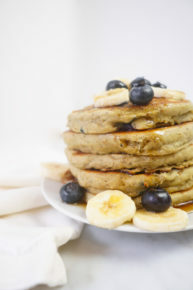 The yogurt pancakes are made with half whole-wheat flour and half all-purpose to allow for major volume and springiness, but you could use straight whole-wheat flour if you’d like. They’ve also got bananas, flax seeds, and plant-based milk for extra nutrition to fuel your morning. 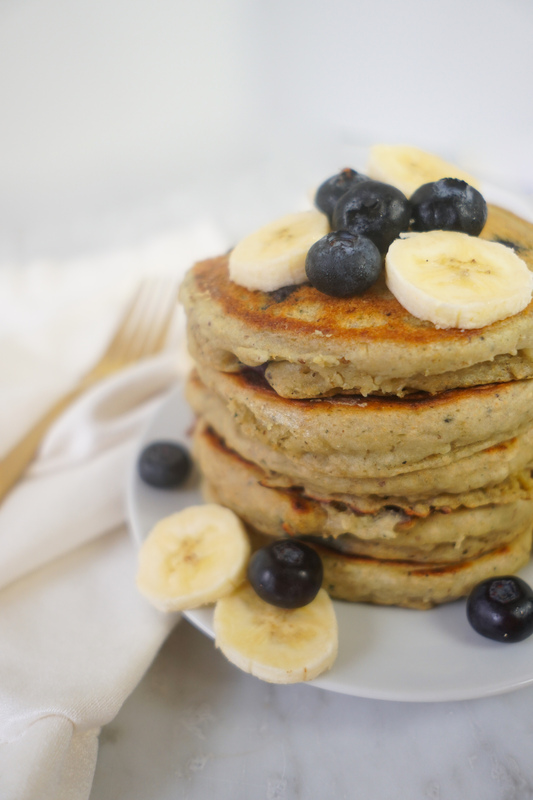 Light, fluffy vegan blueberry yogurt pancakes made with whole grains and healthy ingredients! 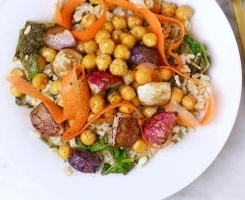 Combine all dry ingredients in one bowl and wet in another. Cook for about 2-3 minutes per side on a lightly oiled hot griddle (I used a cast iron skillet). Fyi, you can find the Yogurt Alternatives in grocery stores in the U.S., including Natural Grocers, Sprouts, Lucky’s, Jewel, Giant Carlisle, and Safeway. Weigh in: Do you enjoy waffles or pancakes more? 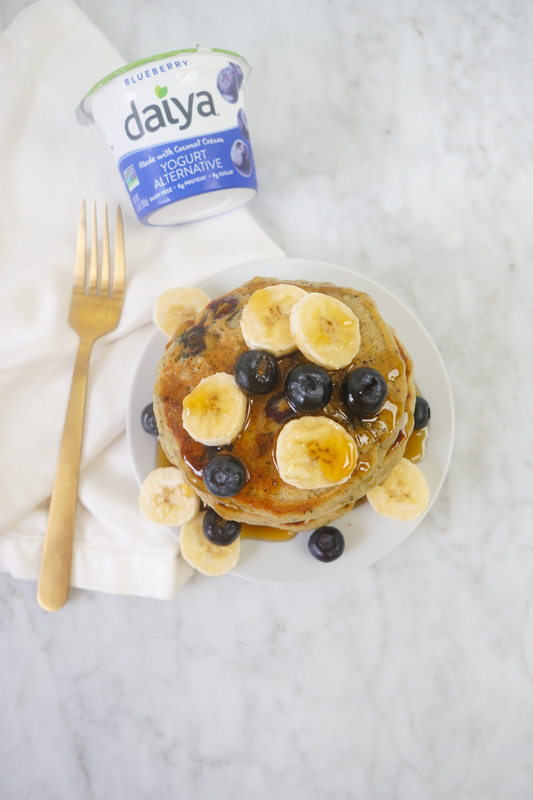 Will you try these blueberry vegan yogurt pancakes? *This post is sponsored by Daiya but all opinions are my own. I thank you for your support of Whitney E. RD-approved partnerships that make this website possible.